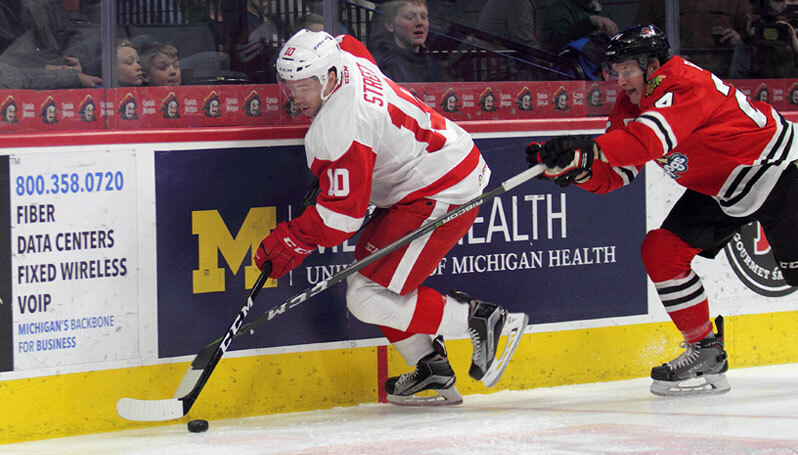 GRAND RAPIDS, Mich. – Ben Street, Eric Tangradi and Matt Puempel tallied three points apiece to lead the Grand Rapids Griffins to a 5-3 victory over the Rockford IceHogs at Van Andel Arena Friday night. The win marks Grand Rapids’ first over Rockford in the 2017-18 campaign, and its sixth win in seven games. Matheson Iacopelli struck twice for Rockford while Matthew Highmore added his team-leading 15th goal of the season to keep the IceHogs in the game, but Rockford has now lost each of its last four outings, and has been outscored 20-9 in that span. After Puempel and Matt Lorito combined to give the Griffins a first-period lead with a power-play tally for the latter, the teams traded goals in a wild six-goal second period. Dominik Shine first doubled the hosts’ lead 2:03 into the middle frame, but Iacopelli responded just 14 seconds later with his first of the game. Then, eleven seconds after Iacopelli’s goal, Grand Rapids regained its two-goal lead as Street put home his first goal of the contest. Iacopelli notched his second at 5:01 of the second period before Eric Tangradi found twine to make it 4-2 in favor of the Griffins. Highmore added his marker at 14:04 to send the teams into the break again separated by just one goal. Rockford’s comeback bid fell short in the third period, as Street potted an insurance goal during a 5-on-3 advantage for Grand Rapids to seal the win. Puempel assisted on both of Street’s goals. Collin Delia turned aside 19 of 24 pucks for the IceHogs, while Jared Coreau earned the win for Grand Rapids with 33 saves on 36 shots. The loss drops Rockford to fifth in the Central Division. Next Home Game: The Rockford IceHogs host the Cleveland Monsters on Saturday, Jan. 6. The first 1,500 fans into the BMO Harris Bank Center on Saturday will receive a free IceHogs winter hat, courtesy of BMO Harris Bank. Tickets can be purchased at IceHogs.com, by calling (815) 968-5222 or in-person at the BMO Harris Bank Center Box Office.